Flir's M232 Pan and Tilt Thermal Imaging Camera provides an affordable solution to night vision! See in complete darkness with the M232 with 320 x 240 thermal resolution and 2x digital zoom. Currently only compatible with the Raymarine Axiom MFD's and several Garmin GPSMAP units. Soon to be compatible with multiple manufacturer's MFD's thru a FREE software update. 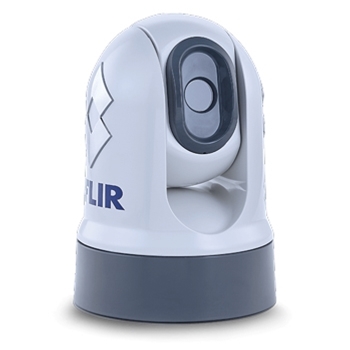 The M200 from FLIR provides an enhanced level of safety and navigation. Small in size the M232 can see a person in the water up to 1,500' away while viewing a small vessel up to 0.67nm away! With a 360° continuous panning view and a tilt view of +110°, -90° this compact camera offers a 24° x 18° field of view ensuring you can see your surroundings and maneuver through the water with confidence and ease. An exclusive benefit of pairing the FLIR M232 with a Raymarine Axiom MFD is ClearCruise Intelligent Thermal Analytics which will provide audible and visual alerts when "non-water" objects such as a boat, buoy, or person is identified with your scene. You must have an Axiom display to have this feature. **Currently only compatible with Raymarine Axiom MFD Displays, Furuno TZ Touch(Feb. 2019 Software Update) and Garmin GPSMAP 7x2/9x2/10x2/12x2/74xx/76xx/80xx/82xx/84xx/86xx(with the November 2017 software release). *Updates will soon be available for future compatibility with other MFD Manufacturers. *Please note Garmin POE Coupler and Garmin Marine network cable are required when connecting to Compatible Garmin GPSMAP units. Each FLIR M232 Pan/Tilt Thermal Image Camera comes with: FLIR M232 Pan/Tilt Thermal Image Camera, Thermal Camera Base Seal, Thermal camera fasteners: nuts, dome nuts, spring washers, flat washers, and threaded studs, Power Cable, Raynet to RJ45 Adapter Cable, Raynet to Raynet Cable, Documentation Pack and a Two-Year Warranty . The FLIR IP to Video Decoder allow you to connect the M132/232 to an analog video input on you MFD.